After a ten year hiatus, Steve Roach and Dirk Serries (formerly recording as vidnaObmana) reconnect to begin anew. The result is Low Volume Music, an introspective musical palette solely dedicated to harmony, integrity and pure beauty. In a world where the noise level of daily life has increased to a fever pitch, this release offers an essential sonic respite from the external distractions. These five delicate sound meditations appear in the listening space like slowly drifting incense. The pieces are built upon a perfect blend of deep ambient characteristics: looping and lush textures and harmonics mixed with subtle, hovering, lattice-like forms. The tracks follow a zen-like flow, bringing the listener’s attention down to a distinct stillness, a single point; gently shifting, sparkling mirror pools of sound are revealed as meditations to reflect upon. The understated beauty of Low Volume Music offers a path back to the soulful nourishment found at the quiet center. Over the course of their six releases and many international concerts, Roach and Serries pushed the edges of ambient electronic music, then when the time felt right they respectfully stepped away to pursue other work. With Low Volume Music, Roach and Serries reconnect to create a beautiful release, displaying a vision sublimely refined, minimal, and true. This is perhaps their most personal collaboration to date. 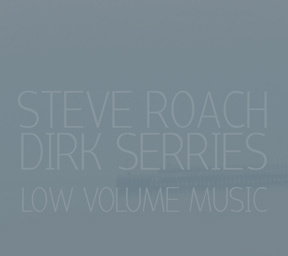 Both Steve Roach and, in his Vidna Obmana guise, Dirk Serries have worked together in the past as well as on their own — an understatement, given the two composers’ extended discographies — so seeing them come together once more after nearly a decade apart is one of those steps that’s both familiar and promising. The sometimes gentle and always compelling nature of their work is remarkable, and with Low Volume Music they created yet another standout in 2012. The titular suggestion need not be the way to listen to the album — there’s something enveloping about a higher-volume listen to the songs — but the emphasis on something contemplative and quietly there lends itself perfectly to the kind of ambient approach originally formalized by figures such as Brian Eno, something not to necessarily concentrate on in full while still enjoying its process. There’s also less of a sense of deep depths as suggested by heavy echo or quick or aggressive percussive or rhythmic elements, though both have figured in both artists’ various works — there’s instead a sense of calm control throughout, where the serenely moody tones in the background of “Whisper” aren’t ominous so much as deeply calming, soft curls of further melody flowing through the mix in its own pattern in turn. “Bow” in particular is one of the calmest and one could almost say sweetest things either of them have ever recorded — without sounding like a stereotype of new age music as caricature, there’s something so nicely engaging and calming about the flow of “Bow” over nearly a quarter of an hour that one could almost bathe in the music.